Thursday 11th April saw the national launch of ACoRP's new report THE VALUE OF COMMUNITY RAIL. Members of FOGS welcomed Jools Townsend Chief Executive of ACoRP, Nik Schofield Communications and Marketing Manager and Rob Lowson author of the report to the station. With glorious sunshine providing a bright backdrop to the photos Jools, a first time visitor, was then shown around the features of our station including the new moon themed Poetry Platform display, the Lowestoft commemoration and an explanation of the historic links to the past and the Dukes of Norfolk. Nik had a similar tour earlier in the afternoon. The report, commissioned by ACoRP in response to the Department for Transport's new Community Rail Strategy, shows the economic, social and environmental qualities of community rail with extensive evidence collated by Rob from rail volunteer groups and community rail partnerships across the UK. Headlines include over 8,500 community rail volunteers giving 390,000 hours annually to their stations and local lines with an economic value of £5.6M. Between 2017 and 2018 passenger numbers on lines with community rail partnerships increased by 42% compared to a 35% rise on those without partnerships. This excellent report should prove invaluable to all those involved in community rail! An online copy can be downloaded here by using this link. Hard copies will be available from ACoRP's Huddersfield HQ after Easter - contact Rob Lowson. Our thanks to Mike and his Staff at TWIG Station cafe for their attentive hospitality and to Nik and Rob for providing refreshments for FOGS. A big thank you also to our guests Jools, Nik and Rob - a most enjoyable occasion! We wish the report every success. The moon rises over Glossop Station for a new artist! PHASE TWO of the historical sign boards project is nearing completion. Boards have been prepared for Ashburys, Gorton, Fairfield and Hattersley. Much work has gone into the creation of the contents by Paul Abell (Ashburys and Gorton), Jeroen Blom (Fairfield) and Babs Allen (Hattersley). Neil Williams has provided additional advice. We thank Anne Michaelides at naturedesignsign for her patience during checking processes and for producing four excellent designs! Paul Abell's editorial skills have also been much appreciated. Peter Longden interim Glossop Line Manager for Northern has viewed possible sites for the boards. This was followed up by a visit on Friday 22nd February by those involved led by Steve Forde Community Rail Officer for SEMCRP -the organisation funding these boards. Steve has been a staunch supporter of this project and his report on locations has now been submitted to Northern for final approval. So we look forward to seeing these new boards in situ to complement those at Glossop, Hadfield and Dinting. There will be a formal launch of these boards in the near future and we will publicise this date when known. We are delighted to pass on the news that our regular gating staff: Alan, Tom, Rizwan, Hamza, Daniel and William have recently received a national Superstar Award from their company for the quality of their work at Glossop Station. We offer our congratulations on this well deserved recognition. The team contribute much to the ambience of the station as they meet and greet travellers on a daily basis. We also very much appreciate their ongoing support for the work and projects that we do at the station. We wish you a very happy and healthy New Year! At the start of 2019 we are pleased to welcome a new artist, Chris Taylor, to the Station's Waiting Room Art Gallery. A graduate of Birmingham and then Liverpool Schools of Art, Chris worked in Animation as a career for forty years on a range of cartoon and puppet films for the BBC, ITV and other companies. On retirement Chris, who now lives in Glossop, returned to his first love calligraphy and lettering which he produces from his Meadow Hill Studio in Stockport. His subject matter includes images of wildlife as well as calligraphy collages frequently using bamboo pens and brushes in his work. Chris has exhibited in various venues across the High Peak including Hayfield, New Mills and Buxton Art Gallery. He has also exhibited in Stockport Art Gallery and Museum. His work can now be viewed daily during booking office opening hours at Glossop Station and may be purchased. Contact Chris on 01457 857315. 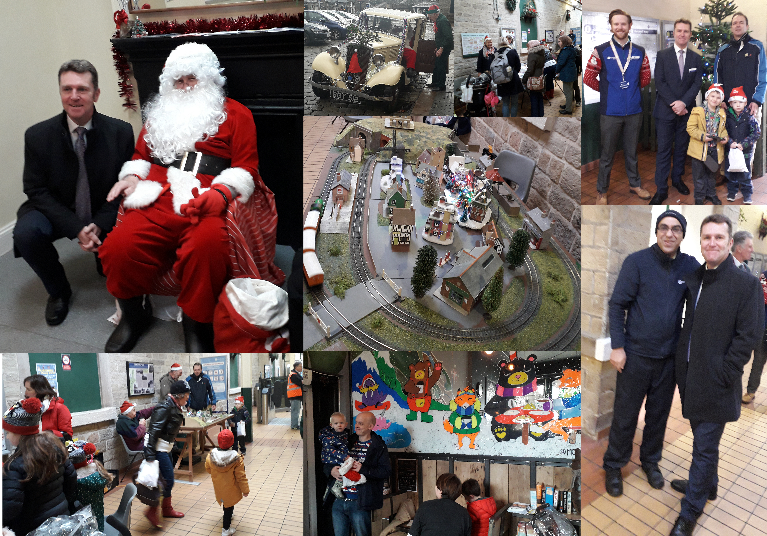 We were delighted to welcome David Brown, Managing Director of Northern to our Santa event at the station on Saturday. David was kindly fulfilling a commitment made in 2017 to switch on our Christmas tree lights. He proved to be a most amenable and pleasant guest engaging in conversation with staff, FOGS and visitors. When switching on the lights remotely using Eric Pass' special gadget, David had everyone smiling when in his speech he said that having control of a "remote" was sometimes a rare experience! We very much enjoyed having David as a guest and we thank him for this visit! Around 45 families visited Santa in the Waiting Room where every child had a chat and, of course, a photo! Santa then gave every child a small free gift. As always being in Santa's presence meant a sampling of the special magic of Christmas! Making a welcome return to the Christmas event was Glossop Model Railway Society under the direction of Martin and Mike. Their seasonal interactive layout proved a hit! Nearby Andrea and Barbara were kept busy as they helped children to create decorations for the tree on the craft table. The lovely tree kindly supplied by Glossop Garden Centre now looks a treat! The music was once again provided by SPINDRIFT and they had everyone's feet tapping. Our sincere thanks to Alison, Peter and Peter. Joining in the fun as guests were Andrew Walker, Partnership Officer for the High Peak and Hope Valley Community Rail Partnership, his wife Linda and their grandchildren. Their ongoing staunch support is much appreciated. Also joining us for the event was Simon Brooks, Glossop Line's Northern Manager, looking suitably festive! We would like to say a big thank you to Simon for his advice and support in organising this event during the ongoing industrial action and for all his help on the day. Our sincere thanks of course to everyone who came on the day in awful weather to support us! From all of us at FOGS to all of you - a very HAPPY CHRISTMAS! FoGS CHRISTMAS EVENT THIS WEEKEND! The Friends of Glossop Station Christmas event is on this weekend! Come and meet Father Christmas in the station Waiting Room. 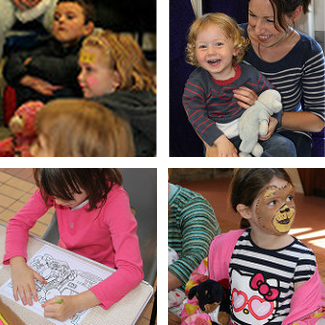 Music and craft activities with the Christmas tree lights switch on at 11.20. Come and join in the fun! This morning Pete and Neil on behalf of the group welcomed Ruth George MP for High Peak to the station for a pre - arranged tour. It was Ruth's first visit to the inside of the station! We were able to show her various projects with which we have been involved such as the vintage lantern style lights and recent display and information boards. Ruth showed an engaging and empathetic interest in our work as we toured the station. She took time to meet the gating staff and had a chat with Dave at the booking office about his work. The visit also allowed Pete and Neil to discuss current issues including the case for CCTV at Dinting station and the possible impact on the current timetable if planned changes take place to the type of trains currently providing the service on the Glossop Line. We have promised to supply further information to Ruth on this issue. Neil also explained the work of WICR -Women in Community Rail - to Ruth and its championing of more women in the rail industry. Penny, in FOGS, is a keen and active member of WICR and we are keen to promote its work and aims. Neil also praised the work of Andrew Walker and The High Peak and Hope Valley Community Rail Partnership as being an excellent local working forum for the Buxton, Glossop and Hope Valley Lines. Ruth was also interested in the commemorative display on the Lowestoft Evacuation and Neil explained the background to the story. Before leaving the station Ruth took time to visit the warm and welcoming environment of TWIG cafe where she spoke to staff and admired the Christmas decorations. We thank Ruth very much for finding the time in her busy schedule to visit us. Neil gave her, on leaving, a copy of the 2018 ACoRP Awards' booklet in which our recent awards are highlighted. Ruth had kindly commended us on gaining these. It was overall a most pleasant visit! It's beginning to look a lot like Christmas . . . at the Station! Join us as around the tree at Glossop Station as we switch on the lights with Father Christmas as we begin the run-up to the Festive season on Saturday 8th December!